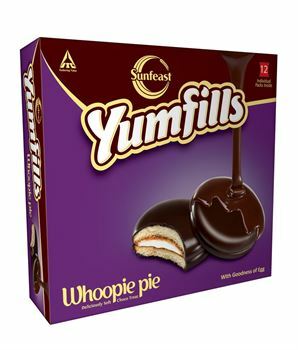 Last week when I took my three and half year old son to the Super store, then it resulted in the sale of Sunfeast's Yumfills Whoopie Pie. We bought this product for the first time, whereas we have bought Lotte Chocco Pie many times. My son didn't like these Pies much so I finished them off. After eating around 5 Yumfills, I am going to share my review with you. Sunfeast is a brand of ITC (a big name in Indian eatable items). I will compare this product with Lotte Chocco Pie and also give my own opinion. As a product, I didn't like it much because of excess bitterness of cocoa, which is not present in Lotte Chocco Pie. Its taste remains in your mouth for a long time. If I compare it to Lotte Choco Pie then Lotte Choco Pie looks to have a bigger edge on the Sunfeast Yumfills Whoopie Pies. Sunfeast Yumfills are not suitable for vegetarians because of use substances made of animal origin where Lotte Choco Pies claim that they are 100% vegetarian. I have not much issue with the vegetarian or non-vegetarian food items; however, I consider the quality and taste of a product. The prices of both the brands are almost same and with good offers on Lotto Choco Pie, it even costs less than Yumfills. When you have two options of almost similar products, then you will definitely lovc to buy the best one and in this case Lotto Choco Pies are the winner. If I don't compare Yumfills to Choco Pie then I also I will say that I didn't like these pies much. There taste is bitter and they give you an uneasy feeling after eating them. When we eat a product, then we need to be extra careful because this product can affect our health. Next time, I will not buy Sunfeast Yumfills Whoopie Pie because I don't like them and I have a much better option available in front of me. This product may suit people who like the extra choco flavor and those who have no problem with Non-vegetarian material used in it. My rating for the Sunfeast Yumfills Whoopie Pie is 4 out of 10.